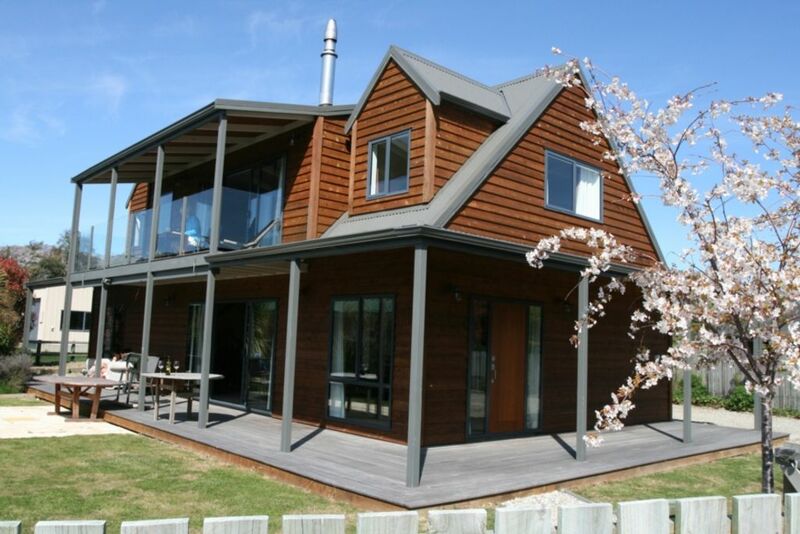 Our huose is a modern 2 storey cedar house built in 2006 with fabulous views of Lake Hawea and the surrounding mountains. This is an ideal spot for all summer and winter outdoor activities and perfect for one or two families.We are 12 minutes drive to Wanaka. For skiers it is 25 minutes to the foot of the Cardrona skifield road and about the same to the foot of the Treble Cone Skifield Road.The house has 2 heat pumps, a wood burner with a supply of wood,and a couple of extra portable heaters for winter though is double glazed and easily heated.There are 2 mountain bikes for guests use and a great cycle track down the river to Wanaka. The large double garage is available and very useful in winter when frosty. There is also room for at least 3 other vehicles and a boat inside our gates. Hawea has the newly renovated Hotel with bar and a great restaurant. The shop, 150 metres away, sells wine and beer, has a cafe and Sailz Restaurant above it. Also has lots of brochures about Otago Lakes activities and the owners and staff are very friendly and helpful. It's a 3 minute walk to the lakefront with its reserve and 7 km of walks along paths and the beach to John's Creek.No houses are built on the beachfront at all! Blissfully peaceful with superb mountain scenery all round. The garden is fully fenced so is toddler friendly. Wanaka has plenty of shops, a supermarket and lots of other entertainments. The showers are hot, powerful and virtually instant, ideal after an active day and then a seat in the upstairs lounge or on the balcony watching the sunset over the mountains with a local Pinot Noir in hand is just wonderful, for some it borders on obligatory. We hope you will come and explore this idyllic spot and enjoy it as we do. Our house is fantastic value, many guests have said. Please note that Christmas and New Year bookings are only taken in September so do not enquire before this. Other dates are 3 months in advance. We ask that you clean bathrooms, kitchen, laundry and vacuum all floors leaving our house as you would like to find it. If pets are to go with you we must be told in advance. Large dogs must be outdoors only. We ask for half the total amount as deposit at the time of booking and half the week before you arrive. If you have any special needs or requests please just email me. Thanks. Short three minute walk to the reserve and beach. A very peaceful and relaxing place. Great property, super location, warm, clean, handy to pub and shop. Gorgeous property, clean, tidy and perfect for our stay. Gorgeous property, clean, tidy and perfect for our stay. Easy walk to Lake Hawea Hotel and general store and to lake front which was lovely as we had a sunny day. Rooms were all great and it was fab having a fire. Would definitely stay again! Large warm house with stunning lake views, perfect location for your stay in beautiful Hawea. Awesome location! Suited our needs perfectly! Thank you!